The 34th annual New Year Ultimate Fest was held January 30th and 31st, 2016 in Phoenix, AZ at Phoenix Reach 11 Sports Complex. The official New Year Fest Program and Schedule (Updated 1/26) have been posted! 11th Edition Rules, except where noted. Pool schedules vary by the size of the pool. See the schedule for details since you may have 3, 4, or 5 games on Saturday. ...except Women’s A and Open A finals are first to 15. 20-yard brick on out-of-bounds pulls. Mirror at half, no halftime. Finals will have a mirror halftime. 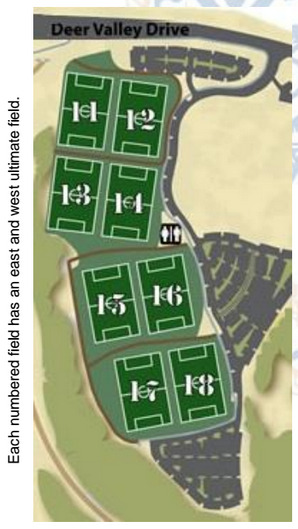 New Year Ultimate Fest 34 will be held at Phoenix Reach 11 Sports Complex. The party will again be held at the tournament hotel, Plaza Inn & Suites/Comfort Inn Phoenix North, on Saturday evening! Cut-off date for reservations is Jan. 15th. Reservation must be made by 12:00 midnight the day before the cut-off date. If your team wants to take advantage of the hotel deal, reservations must be done over the phone by calling Erica Montoya of The Comfort Inn Phoenix North at (602) 978-2222 ext. 512, Monday through Friday during normal business hours, and explaining you would like to make reservations as part of the ultimate frisbee tournament.